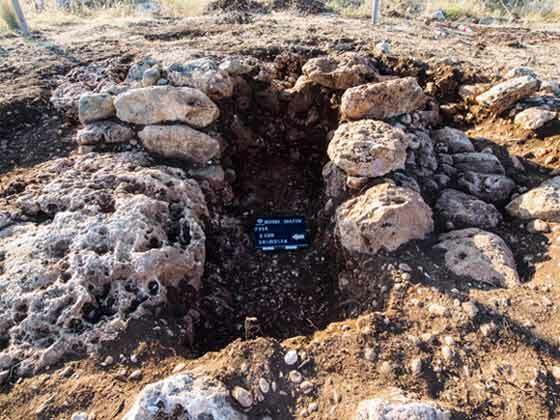 In May 2014, a salvage excavation was conducted in the eastern part of Rosh Ha-‘Ayin (Permit No. A-7114; map ref. 198637/666680; Fig. 1), along the route of a planned service road between the northeastern end of the city and the Cross-Samaria Highway. 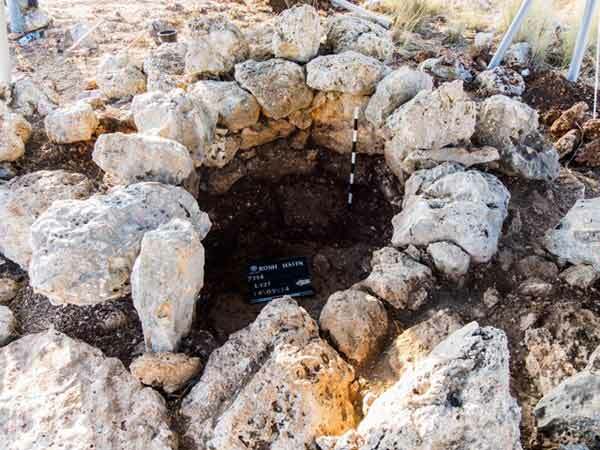 The excavation, undertaken on behalf of the Israel Antiquities Authority and financed by the Ministry of Housing and Construction, was directed by A.S. Tendler and L. Drezner (area supervision), with the assistance of Y. Amrani and E. Bachar (administration), M. Kahan, R. Mishayev and R. Liran (surveying and drafting), A. Peretz (field photography), J. Marcus (substitute excavation director) and C. Ben-Ari (GPS). In a development survey and salvage excavation conducted prior to expanding the town of Rosh Ha-‘Ayin, numerous agricultural remains were exposed, such as field walls, field towers, winepresses, cisterns, agricultural roads and lime kilns, as well as a government building from the Persian period, farmhouses from the Persian and Hellenistic periods and tombs from numerous periods (Shadman 2014). 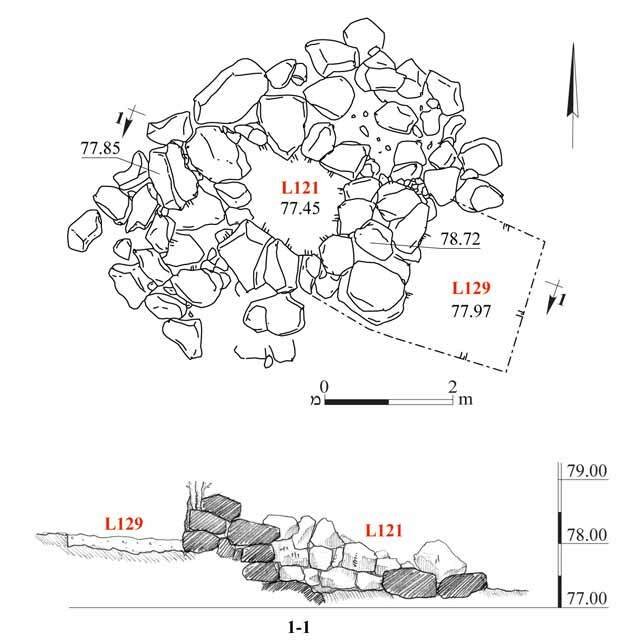 The road is planned to pass along the outskirts of Khirbat Umm el-Bureid, where Byzantine-period remains were documented: buildings with ashlar masonry, remains of an olive press and a built pool (Kochavi and Beit-Arieh 1991: Site 108). Settlement remains from the Byzantine, Mamluk and Ottoman periods were documented at Horbat Dayyar (Khirbat ed-Duweir), west of the planned service road (Kochavi and Beit-Arieh 1991: Site 75). 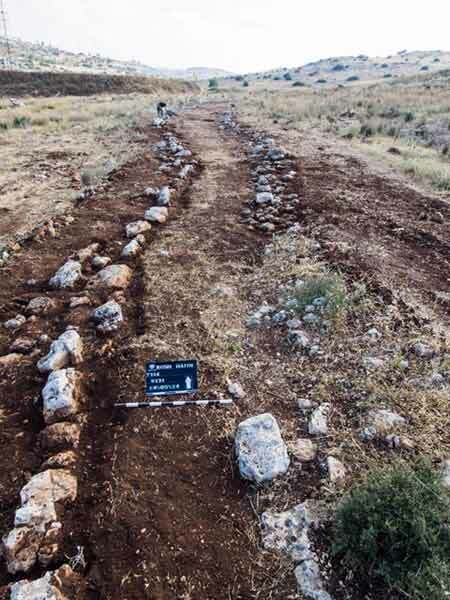 The route slated for the service road ran adjacent to Nahal Susi and next to Khirbat Umm el-Bureid and Horbat Dayyar, which were documented in the Archaeological Survey of Israel. In the current excavation, field walls, an agricultural road and two field towers were exposed. These are indicative of the agricultural activity that occurred in this region in antiquity. Sixteen field walls (Fig. 2) were exposed. Most of them were built in a northeast–southwest direction (W101, W102, W105–W111, W114, W124, W125, W132) and were apparently used to delimit agricultural terraces on the slopes descending toward Nahal Susi in the east. Other field walls were constructed along an east–west axis (W104, W112, W113), probably for the purpose of demarcating cultivation plots. The walls were built of small and medium-sized fieldstones and were generally preserved to a height of just one course, probably due to erosion. Two circular field towers were exposed. They were built of large fieldstones set directly on the bedrock. The southern tower (L128; preserved height 1 m) was constructed of especially large fieldstones and survived to a height of two courses (Figs. 4, 5). The northern tower (L121; preserved height c. 2 m) survived four-courses high (Figs. 6, 7). The towers were found covered with stone collapse and filled with an accumulation of soil and small and medium-sized fieldstones. It is generally believed the towers were used for the cold storage of the grapes and must in the vineyard, for storing tools and as a temporary dwelling for the vineyard keepers (Dar 1982:174–175). Worn pottery sherds belonging to various types of vessels and dating to the Hellenistic, Byzantine, Mamluk and Ottoman periods were discovered above the towers and near the field walls. They were apparently swept there from the nearby hills and do not date the towers or the walls. The excavation finds indicate extensive agricultural activity that took place in this region in antiquity. Dar S. 1982. The Settlement Distribution of Western Samaria during the Second Temple Period, the Mishna and Talmud and the Byzantine Period I. Ph.D. dissertation. Tel Aviv University. Tel Aviv (Hebrew). Kochavi M. and Beit-Arieh I. 1991. 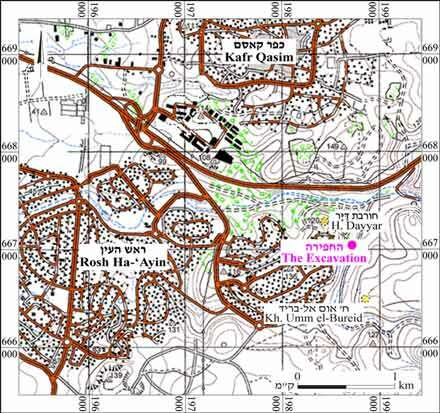 Map of Rosh Ha-‘Ayin (78) (Archaeological Survey of Israel). Jerusalem. 3. Agricultural road, looking north. 4. The southern field tower, plan and section. 5. The southern field tower, looking east. 6. The northern field tower, plan and section. 7. The northern field tower, looking east.